Each year several hundred UMBC students take advantage of the summer months to explore careers related to their majors, expand their knowledge and skills, and learn more about themselves through internships. The advancement of UMBC alumni as non-profit, corporate, and public service leaders as the university approaches its 50th birthday has added another layer to those internship opportunities: a chance for current students to work directly with alumni mentors. One local nonprofit hosted four UMBC social work students focused on elder services in Baltimore communities. LaToya Solomon ‘17, Emily Preston ‘17, Jessica Praybe ‘17, and Sabrina Hall ‘18, interned with elder services coordinator Lauren Averella ‘11, social work, at Cities for All Ages, a Civic Works program where Averella also interned as a UMBC undergraduate. Solomon heard about the program from a professor, and Preston, Praybe and Hall learned of the internship opportunity while attending a panel organized by Phi Alpha, the social work honor society at UMBC. Averella was one of the panelists and they were impressed with what she said about her work in Baltimore. “I was really looking for a way to get my foot in the door, and I’m not sure which social work path I want to someday work in, so I wanted to try working with older adults,” explained Hall. Cities for All Ages typically hosts two UMBC interns each summer, but Averella says this year’s candidates were so strong in their interviews that the organization decided to expand the number of positions to accept four. She has been impressed by their growth and the results of their work this summer. Working as community organizers, the interns planned community events, visited neighborhoods around the city to share resources, and wrote monthly newsletters sent to an audience of 1,500. The students shared that budgeting, soliciting donations to support community events, and meeting deadlines were the most challenging aspects of the internship, but working with clients proved tremendously rewarding. In addition to guiding the interns through their summer experience, Averella encouraged the students to shadow leaders in different roles, working on a broad range of projects. Averella says, “I encourage everyone to try everything,” to move beyond their comfort zones and get a sense of the range of career possibilities. 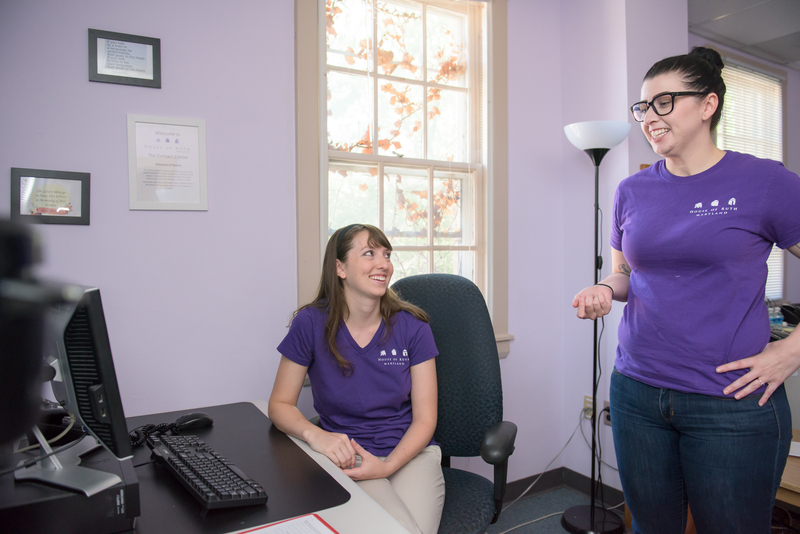 At House of Ruth, a shelter for victims of domestic violence, located a few miles from Cities for All Ages, Sondheim Public Affairs Scholar Allie Mann ‘17, psychology, is answering a 24-hour hotline. “I take calls from people who are experiencing intimate partner violence,” she explains, as well as from people who need help and support for other reasons. Over the course of her internship her confidence grew, as she saw the impact of her work. “There are some people who I’ve talked to who when they’ve called back they’ve asked for me…Once they’ve told their story, it’s nice that they know someone here knows their story,” she says. Erin Fox ‘08, gender and women’s studies and sociology, is supervising Mann, who is also a gender and women’s studies minor and who shares the same UMBC faculty mentor. She has been impressed by Mann’s deep commitment to the House of Ruth’s mission, and also wants to encourage students who are less familiar with the work service organizations do to see internships as a foot in the door. “The reason you get an internship is to get that practical experience. So if you haven’t done something like this before, it shouldn’t be a barrier to you applying. If you look at the skills you learn through school and other jobs, a lot of them probably apply to the internships you’re applying for,” says Fox. Mann says that her time at UMBC has “largely been shaped by service,” and she plans to continue her internship during the fall semester with support from the Shattuck Family Entrepreneur Internship Program coordinated by the Career Center and Alex. Brown Center for Entrepreneurship. 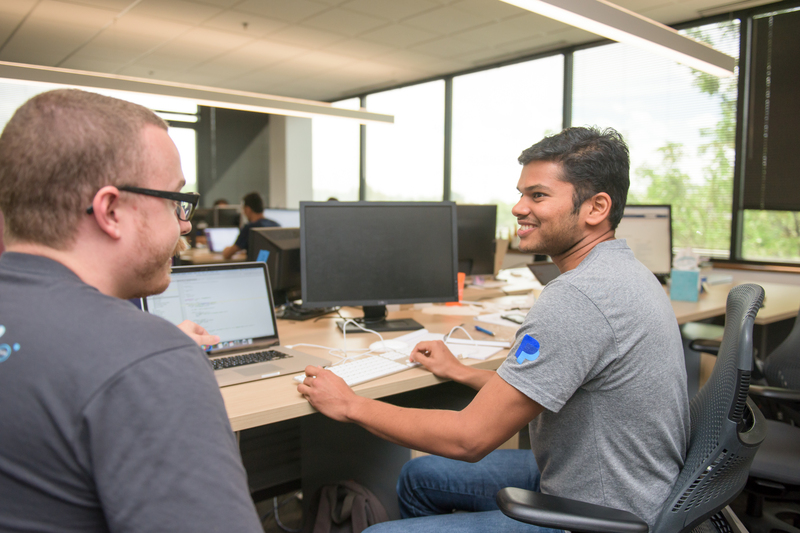 Phanindra Kumar Kannaji M.S.‘19, computer science, spent the summer at PayPal in Lutherville-Timonium, in an internship he found through UMBC’s Career Center. Kannaji arrived at his internship interview with questions about the technologies he could expect to see and projects he would be working on. During his internship, his supervisor, Christopher Powell ‘13, computer science, was then able to give him opportunities to work with the technologies he expressed the most interest in learning more about. 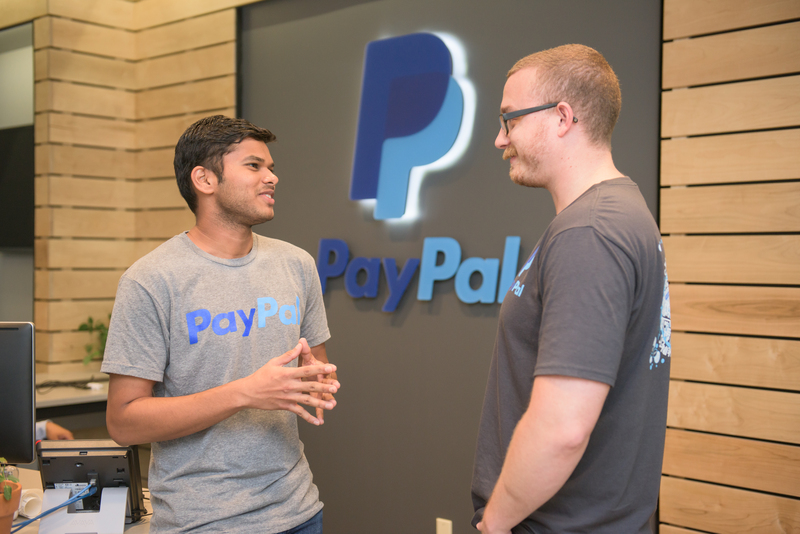 PayPal works to connect interns around the world to one another through workshops and collaborative projects. “What we try to do is not have the interns work in a silo. We really want them to come in and gain the domain knowledge and learn what [PayPal employees] are doing because the ultimate goal is to hire them as full-time employees,” says Powell. David Atlas ‘18, mathematics, spent the summer interning with Nick Welsh ‘93, information systems management, at T. Rowe Price in Baltimore. The two have worked together on data visualization projects— developing ways to display large quantities of information that are easily understandable—and on projects that seek to prevent errors in prediction models relating to financial risk. Atlas feels that his UMBC education prepared him well for his internship both in terms of his approach to learning and work culture. “At UMBC, they definitely teach you to think outside of the box, and to work hard and keep pushing at things,” he says, sharing that he could also sense that focus on hard work and “grit” at T. Rowe Price. One challenge that Atlas faced was determining which projects were the top priority, and which were not as time-sensitive. He learned about flexibility and prioritizing, and the importance of asking questions, especially when doing new tasks for the first time. “There are certain things that are only done here, in this building, so you can’t really learn about them in school,” he says. Justin Kang ‘17, psychology, would like to pursue a career in human resources, and was excited for the opportunity to develop training guides and process internship application materials through an internship with the Madison House Autism Foundation, one of few foundations with a focus on supporting autistic adults. Kang worked closely with Steve Robinson ‘12, history, who was delighted to “mentor a fellow Retriever” who was so interested in the mission of the organization. For more information on how to prepare and apply for internships, and to connect with employers, visit the Career Center. Find photos of more student summer internship experiences—from Apple, Microsoft, and Cisco to law offices, chemistry labs, and construction sites—on Twitter with #UMBCintern. 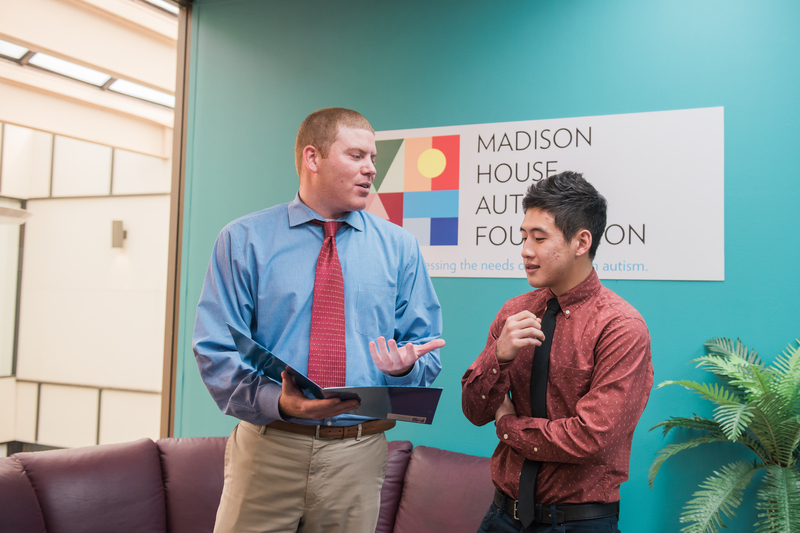 Steve Robinson ’12, history, and Justin Kang ’17, psychology, at Madison House Autism Foundation. Erin Fox ’08, gender and women’s studies and sociology, and Allie Mann ’17, psychology, at the House of Ruth. 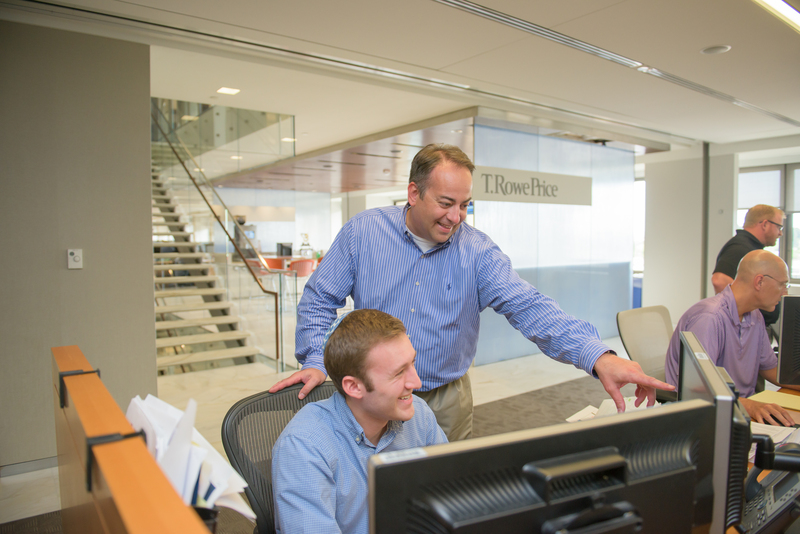 David Atlas ’18, mathematics, and Nick Welsh, ’93, information systems management, at the T. Rowe Price. LaToya Solomon ’17, social work, Jessica Praybe ’17, social work, Lauren Averella ’11, social work, Sabrina Hall ’18, social work, and Emily Preston ’17, social work, at Civic Works. Phanindra Kumar Kannaji M.S. ’19, computer science, and Christopher Powell ’13, computer science, at the PayPal. Allie Mann ’17, psychology, and Erin Fox ’08, gender and women’s studies and sociology, at the House of Ruth.